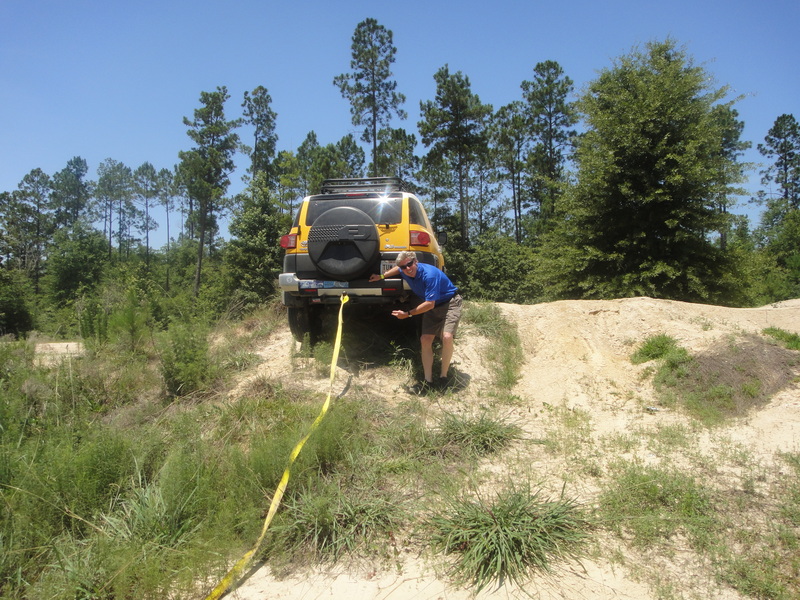 This post describes a trip in 2012 to a local ORV (Off-Road Vehicle) park within an hour drive of home. I joined a couple of friends from work for a couple of hours in a relatively flat area north of Pascagoula, MS. This trip does not describe rocks because there are none. In fact, a geologic map of MS places this area in the Pine Belt, which basically tracks the U.S. coastline from Houston to New Jersey with interruptions for major rivers (e.g. the Atchafalaya River swamp of southern LA) and, of course, the Florida penninsula. This province is often called the Pine Barrens. 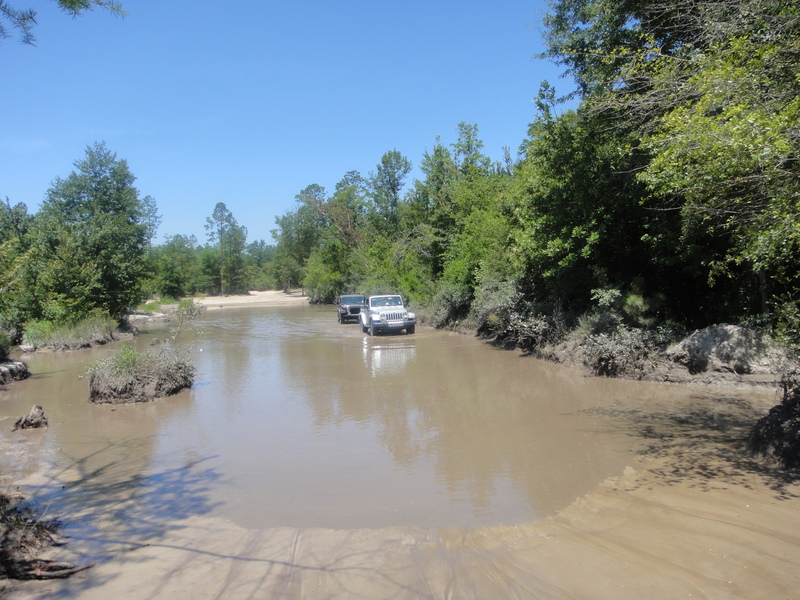 When we go off road here, we are dealing with sand (individual particles have a diameter D > 0.064 mm), silt (D > 0.004 mm), and clay (D < 0.004 mm) distributed by modern rivers like the Pascagoula River to the east of the Red Creek ORV park. The pine barrens of the gulf coast get ~50 inches of rain per year and they are covered with rivers, creeks, and swamps. This park is located in the Pascagoula drainage basin and it is heavily wooded. Going off road here means we will see mud, which is a combination of silt and clay because these can both be carried by slowly moving water. The sand requires vigorous water to be moved. The result is a preponderance of mud everywhere. However, geological processes operate over really long periods of time and rivers move around. We also must note that the average elevation of Red Creek is < 100 feet, which means this area was covered by the ocean within the last 120,000 years when sea level was much higher. So there is leftover (relict) sand wherever a creek/river hasn’t removed it just as in north Florida. 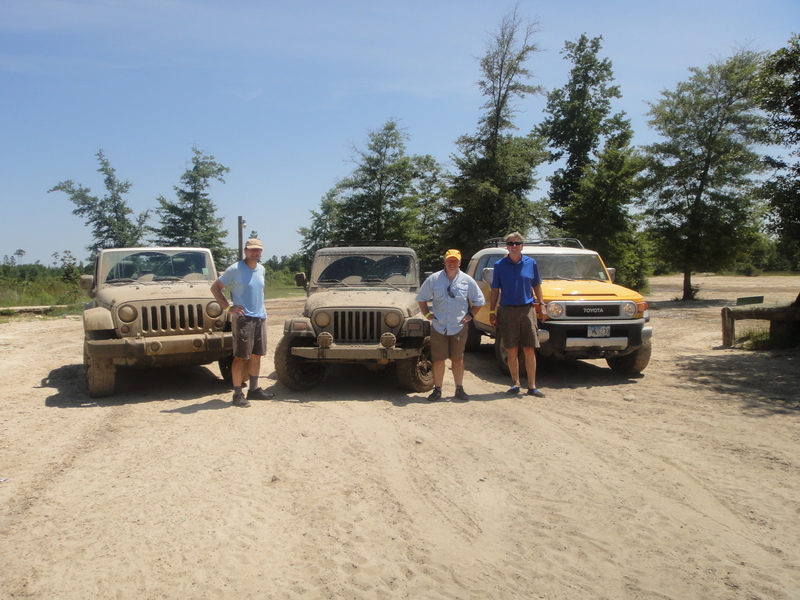 This trip shows us the resultant off-roading experience. 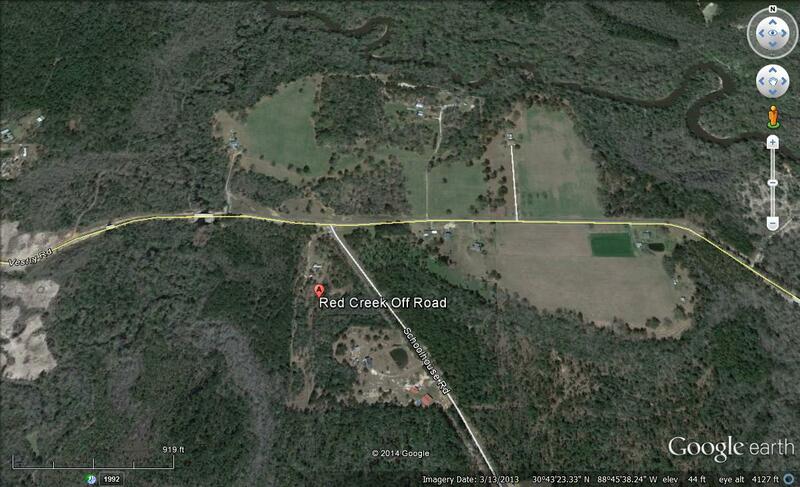 It is difficult to see most of the “trails” in Red Creek ORV park from a satellite. This image shows the main area but the trails in the woods cannot be seen from space. I think Red Creek is the slightly less wooded area west (left) of the park label. We never made it because of mud blocking our path, although we were allowed to go to the creek according to the park rules. After a run down a great sandy trail where we could hit 45 mph in 2WD, we meet our first MUD crossing, which wasn’t bad because this was a flood deposit from the creek on top of consolidated clay and sand. This kind of mud is deposited during floods when high water level will deposit mud in usually dry areas. We found our way to a much sandier area that was much modified by ATVs running in circles (as well as intentional piling for ATV driver entertainment). Desperately seeking adventure, I found my vehicle’s limits on high centering. Because of the massive overbank deposits like those above, it was easy to find mud track created by ATVs and pickups with really BIG tires (~40 inch diameter), so another of our group needs a tow! This park was originally for ATVs only, but most people get bored running in circles and they opened it up to larger vehicles (i.e. 4WDs). We drove around in circles but we found ourselves trapped and we had to break through some mud. Another one bites the dust and has to be towed out. 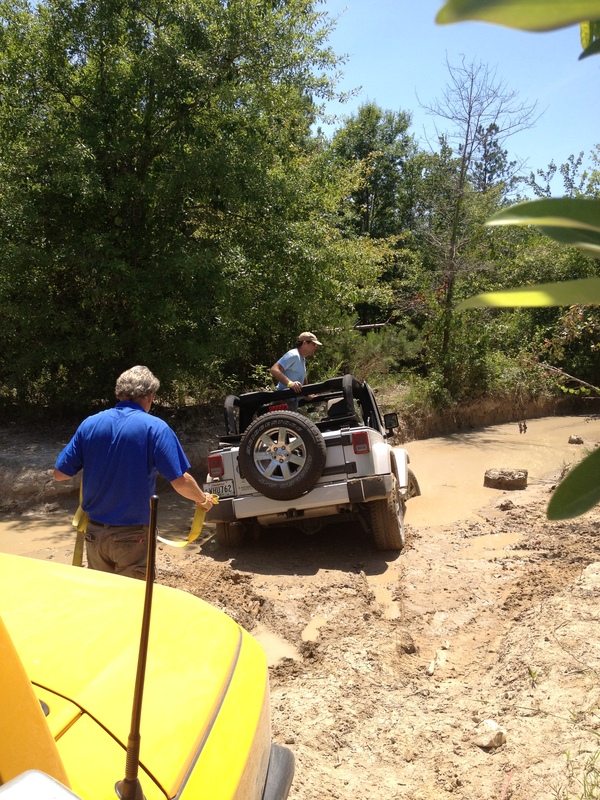 We never did find Red Creek, probably because of poor planning but also the need to deal with MUD everywhere. We all made it home, however, and one of us avoided mud more than the others!